7 Organic Sprouted Grain Tortillas (small Ones) – We used Ezekial Brand yum! Preheat oven to 400. Cook the quinoa, or have it cooked and on hand. Drain your black beans. Get out a baking dish – We used glass pyrex that worked perfect. 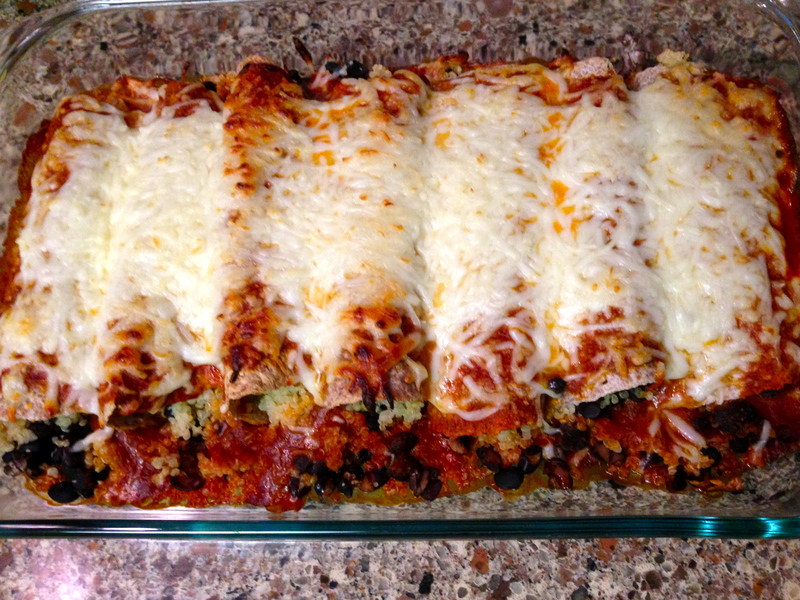 Take tortillas and fill with quinoa and black beans enough to stuff them full but still able to roll them. Proceed until all are rolled. You can use large or small tortillas depending on what you have on hand. Once rolled pour Frontera Enchilada sauce on top then top with Mozzarella part skim cheese. If you are vegetarian simply swap out mozzarella for vegetarian cheese. Cook for 10-15 minutes until lightly golden. If using vegetarian cheese be sure to watch it as it may need less time and you don’t want to burn it. Oven times may vary so keep an eye on it. 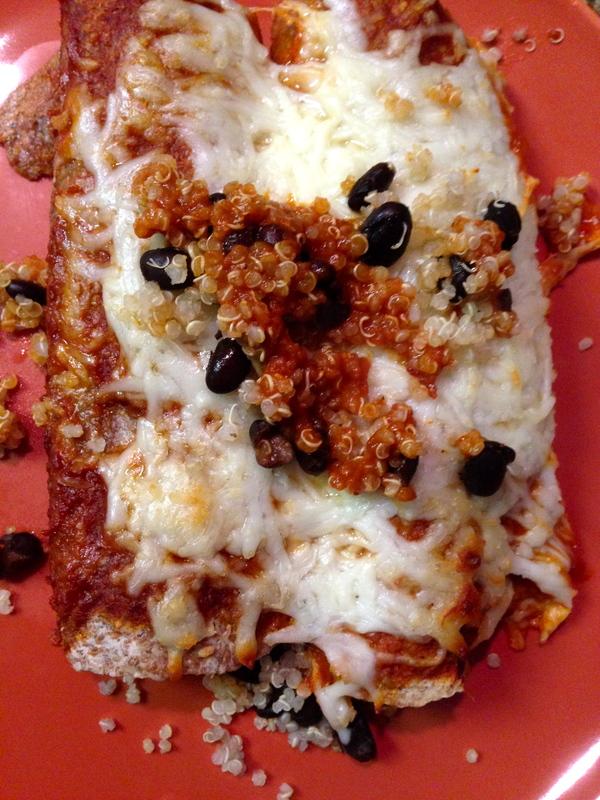 I cooked the quinoa in advance and had it on hand which made the Enchiladas take only 15 minutes. This is an incredibly fast, fresh & healthy meal if you are short on time. You can even make it in advance and have it ready in the fridge. Then you can just pop it in the oven when your home from work. It made a wonderful lunch the next day. You can add fresh salsa with them for a bit more flavor. We combined the Enchiladas with a quick baby greens salad, some gluten free blue corn chips and fresh guacamole for a wonderfully quick and delicious meal that the whole family could enjoy. Yum! Previous Post Fast, Fresh & Delicious Apple Blueberry & Peach Pies – Coming Soon! Next Post Seasonal Berries & Salad Yum!